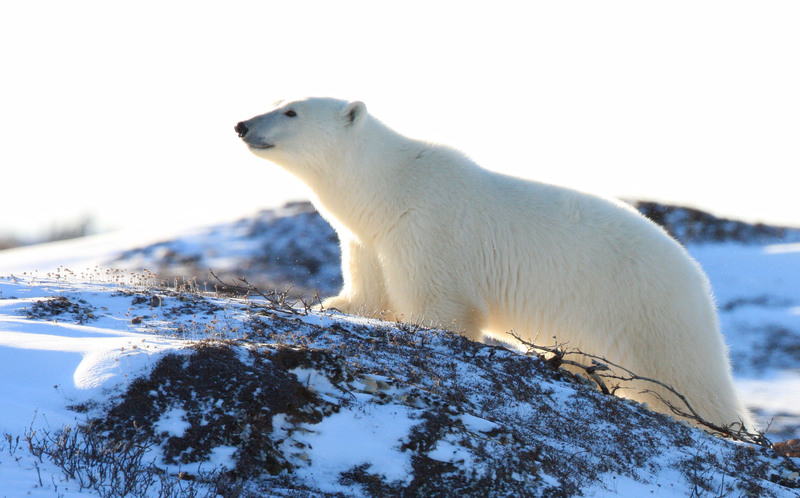 Join us on our 2014 journey to Churchill, Manitoba, to witness the annual polar bear migration. Each fall, after 3-4 months on land in the ice-free season, the polar bears of western Hudson Bay migrate to Cape Churchill, to wait for the first ice to form. The cold north wind pushes freshwater ice from the Churchill River against the shore to form a shelf, where the sea ice will begin to form. In October and November, polar bears arrive from all over Western Hudson Bay and converge at Cape Churchill, waiting to return to the ice, where they can hunt their staple food source, the ringed seal. The Great Bear Foundation has been bringing groups north to observe and learn about polar bears in their natural habitat for thirty years. We offer a high quality, conservation-based learning experience for people of all ages and backgrounds. We have led the way in low-impact bear-viewing that is highly sensitive to the needs and well-being of the wildlife for three decades. This is a unique opportunity to observe polar bears in their natural habitat with a group dedicated to bear conservation and education. We hope you will join us on our 2014 field course. Click here to download information and a registration form. To register, please return the registration form on the last page, with a $250 deposit (refundable up to September 1, 2014) to the Great Bear Foundation, PO Box 9383, Missoula MT 59807. Or contact us for more info.